Of there being a day where no animal lives out of sight of love. Of course, when I speak of animals I have in mind those animals that end up in rescue shelters of one form or another: cats; horses; dogs; ponies; birds; and other species. But on the broader topic of offering love to animals I must share something with you before going on to the main subject of today’s post. 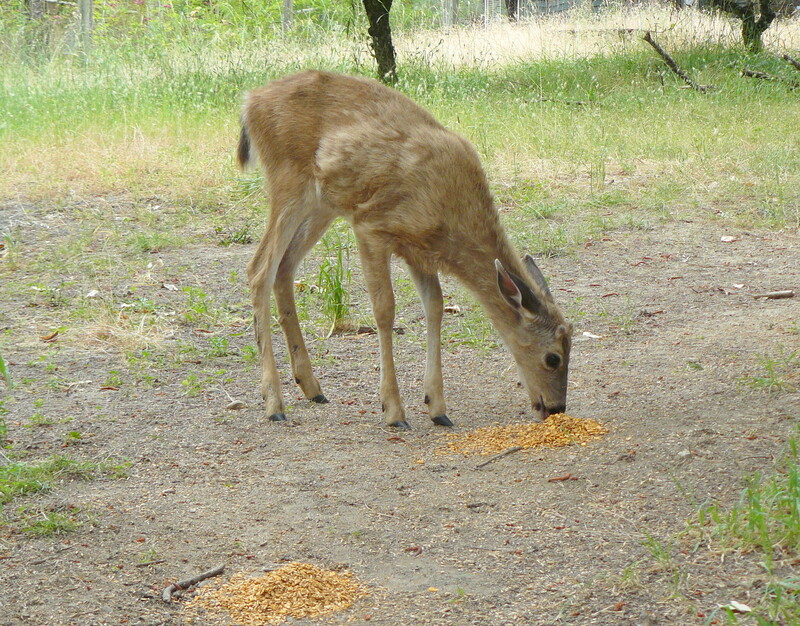 That is that for the last few years we have been feeding the wild deer. Slowly a number of them have grown to trust Jean and me to the point where one particular young female became such a regular that we named her: Doris. It is Doris that is in the picture above eating the cob that we put out twice a day. In fact, I can now gently stroke her neck when she is feeding and will share those pictures with you all in a future Picture Parade post. I call the closeness of me and Doris love. I love how this animal trusts me and, in turn, the care and responsibility that is called for from me. My dream is that the love, care and responsibility offered by people will one day be so widespread and extensive that there comes no call for animal rescue shelters. A couple of days ago Cori Meloney signed up to follow Learning from Dogs. Cori is the author of the blog Three Irish Cats. As is my usual way I went across to her blog to leave a ‘thank you’ note for her decision to follow my scriblings. I immediately saw her latest post and knew without doubt that it should be republished here. Cori very promptly gave me permission to so do. I volunteer with a small (but mighty!) rescue group here in Southern Maryland called Rescue Angels of Southern Maryland. We mostly deal with cats, though we’ve recently begun to rescue dogs as well. Most of the cats we find homes for come from owner surrenders, friendly cats and kittens from our feral colonies, and at-risk animals from our local municipal shelter, Tri-County Animal Shelter. Saturday, Rescue Angels was one of the groups that participated in Tri-County’s annual Clear the Shelters Day celebration. Seventy-seven animals found forever homes that day. Watching the parade of happy animals and their new owners as they left the building was totally worth sweltering in the 95-degree heat. As the only public animal shelter to serve the three Southern Maryland counties, Tri-County is a busy place. It frequently gets full, and organizations like Rescue Angels and others in the area step in when we can to remove animals from the shelter. This is not a no-kill shelter, so a full shelter means animals will die. New animals come in every day. Three things struck me when I was at Tri-County last weekend. The second is that I am increasingly amazed by the dedication of the shelter staff. They have a difficult job, and it often goes without thanks. It’s not easy to be civil to an owner who is dropping off their pet because they don’t want it anymore. It’s not easy to put down perfectly healthy animals because humans have acted irresponsibly. I can only imagine that the staff constantly feels like it is in crisis mode; they may have nearly cleared the shelter on Saturday, but come midweek, those cages and pens will be filled again with animals in need. The third thought is that we, the community, created this shelter, and we need to fix it. Tri-County has a terrible reputation here in Southern Maryland. The kill rate for cats is more than 50 percent. The facility is small and needs renovation and expansion. It is nearly always full to overflowing. Members of the community sometimes say terrible things about the staff. Beautiful Nadine, who found a forever home on Clear the Shelters Day. But Tri-County is constantly full because the Southern Maryland has let its companion animals down. Cats are not spayed or neutered, and they’re treated as disposable. Need to move? Drop your cat at the shelter, or worse, just leave it behind. Dog getting too big? Don’t feel like dealing with behavior or health issues? Drop the animal at the shelter. I’ll be honest: My opinion of Tri-County and its staff has not always been positive. What makes it worse is that I had those opinions without actually visiting the shelter. I am ashamed of that fact. Since I started volunteering with Rescue Angels, I have visited the shelter many times to take cats that our rescue was putting into foster care. 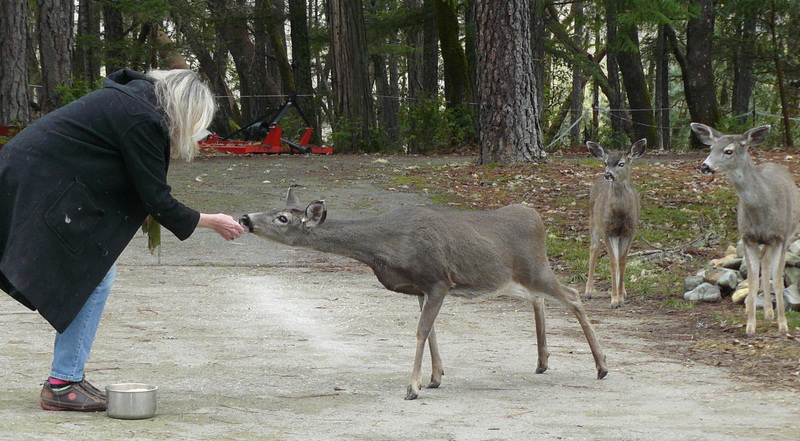 I have met some of the staff members, and they are always happy to talk with me about their animals. They’re ecstatic when an animal leaves the building. The shelter has a rescue coordinator whose job is to work with local rescue groups to remove animals from the shelter when they are at risk of being killed or when shelter life is impacting their well-being. These folks are animal lovers forced into a terrible situation by a community that treats its animals as disposable and Tri-County as its dumping ground. So, now that Clear the Shelters Day has passed, I challenge my fellow residents of Southern Maryland: Visit Tri-County Animal Shelter. Talk with the staff. Visit with the cats in the free-roaming room. Take a dog for a walk. Take pictures and share them on Facebook. Volunteer. Follow Tri-County on Facebook and interact with their posts. Foster, which allows rescue groups to remove more animals from the shelter. Rescue Angels can help you become a foster family for dogs or cats. All three Southern Maryland counties are working on plans to build their own shelter facilities. In the meantime, Tri-County Animal Shelter is our public shelter. It’s our job as the community to support the staff, help care for the animals, and reduce the number of animals killed there. I hope to see you there, leash in hand. So if any reader is within reach of Southern Maryland and wants to offer an animal love, care and responsibility then please make your way across to Rescue Angels of Southern Maryland. How to draw today’s post to a close? In searching for inspiration about all animals living in the sight of love I realised that what I was dreaming of was more about compassion than love; albeit the two states of mind being very close to one another. Loving animals is very much part of protecting this home of ours. Yes, I know it isn’t a Sunday! But it is a National Holiday for the USA, Martin Luther King Jr. Day, and these images taken two days ago seemed an appropriate ‘holiday’ post. 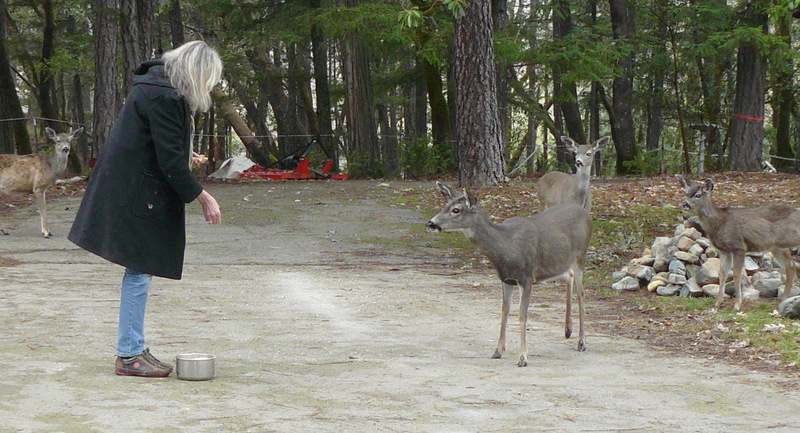 Follows of Learning from Dogs will remember that back on the 15th December I devoted a Sunday post, Picture parade twenty-one, to pictures of deer cautiously coming to feed when Jean was in their presence. 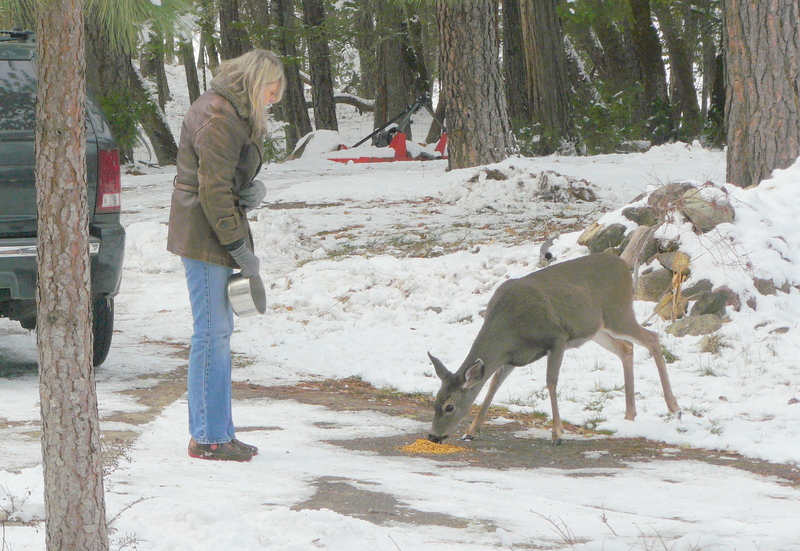 Now, some five weeks later, one of those deer has overcome fear to the point of taking a piece of bread from Jean’s hand. Here is the sequence of photographs taken last Saturday afternoon. N.B. 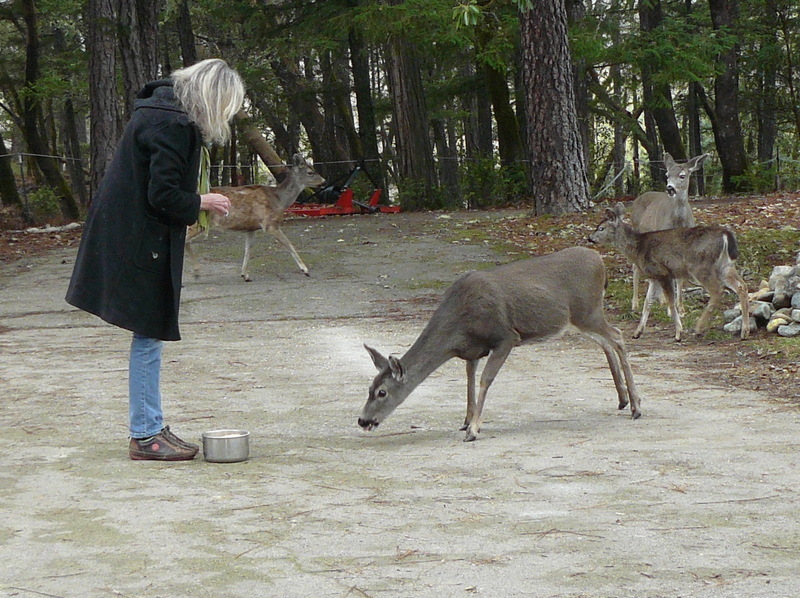 We do not feed the deer bread as a routine; it’s not good for them. Greetings, one and all, this day. A very local coming together. This is a very parochial set of pictures. In that they are of one event that took place last Tuesday, the 10th. 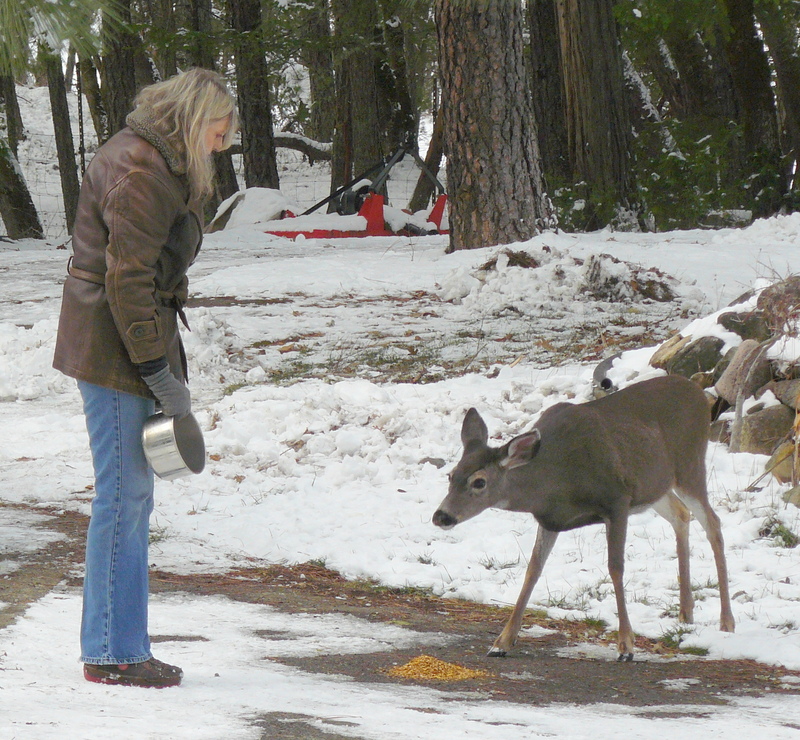 Jean has been putting out food for the local deer for a few weeks in common with neighbours Dordie and Bill. 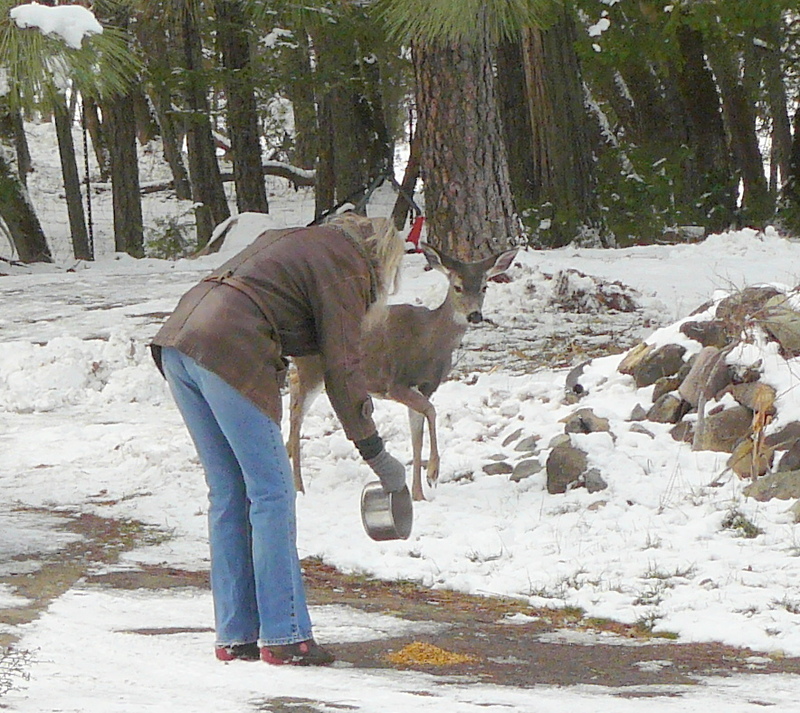 The wild deer have slowly accepted Jean’s efforts to feed them. 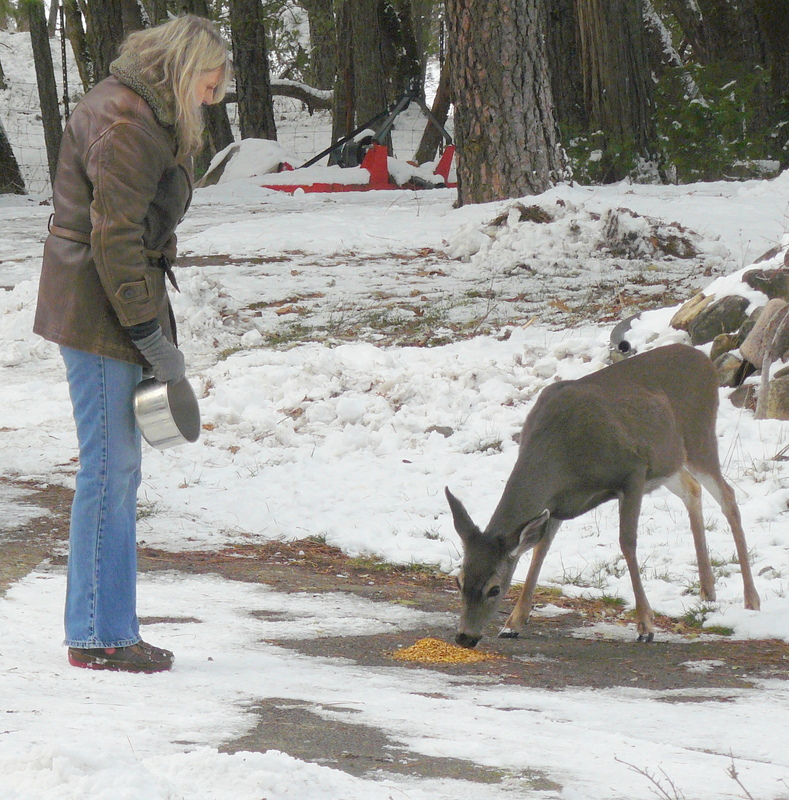 Anyway, last Tuesday afternoon a single deer took the step of feeding on the cob that was put out, with Jean still present. I grabbed my camera and took the following pictures. Looking for food, as per usual. Patiently waiting for Jean to come out. I think this person likes me! A very precious coming together. The precious bond from one to the other. The start of a long relationship. It was just a magical to be behind the camera as it was for Jean to be accepted by this most beautiful of wild animals. 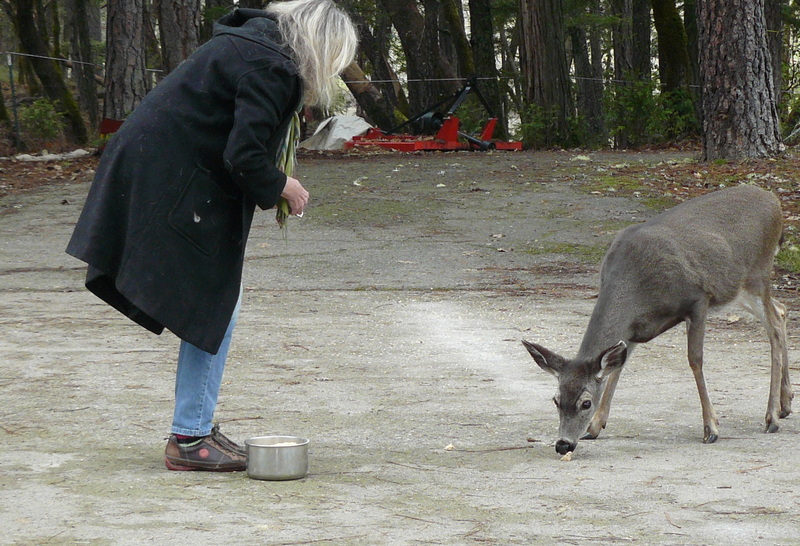 Two or three deer have now become regular visitors in the afternoons when we put out food for them. A short story from author Wendy Scott. Back in July, I published a post reviewing Traveling Light, the novel by Andrea Thalasinos. At the end of that post, I made the following offer. Wiley has offered a free copy of Andrea’s book as a ‘give-away’ from Learning from Dogs. Here’s the plan. Would you like to write a story about any aspect of the relationship that dogs can have with humans? Any length, truth or fiction; it doesn’t matter. Email your story to me to be received by the end of Wednesday, 31st July 2013, Pacific Daylight Time …… [and] I will publish every one received. Just one story was received, from Wendy, and the promised free copy of Andrea’s book has been mailed to her. So here is that short story. The water was angry today. I watched as it tore the tall trees from their roots, thundering, roaring, snapping them, toppling them. I watched as the angry water shredded the shore. I watched as its fury snatched my pup, my baby, sweeping her away like a dying twig torn from the mother tree. I am hunter. I am leader. I ran after my pup, tried to grab her by the nape, take her back. But I failed. I saw her paddle in the froth, scramble atop a long gnarled broken bole that was once a tree. My pup shook, her ears flattened, her tail tucked. She cried. I watched the cold, angry froth take her. My mind sang with the cry of my little grey pup that I could not save, the little one who would never learn about the hunter, the leader. My left shoulder ached where the water nearly took me, hurled a branch at me in frustration. I fell and dragged myself away from the collapsing shore, to higher ground. The rain poured and sleeted to drench the shambles left by water that continued to roar and foam. Mud slid through my feet, gusts took my breath. It was very cold. My ears twitched, hearing nothing beyond the roar of the fury. Water is very noisy when it is angry. The others, my sisters, my mate, I could not scent them, hear them, see them. The day retreated. I blinked to see better, my eyes wide, but they saw nothing that I could recognise. My nose and ears twitched and twisted — nothing. I could hear my little grey one, my pup; she shivered and cried in my mind, but my eyes and ears, my nose … she was gone. I stumbled over broken branches, a drowned fox, mice flushed from their holes, a broken-necked bird, bushes overturned and torn apart, walls of fallen trees. Daylight was lost in a twilight. Now, I scented a 2-legged. I stilled. Crackling. Smoke, deep and hard to breath. Rabbit, burnt. These were the smells I knew of the 2-leggeds. One was near. I crouched and crept. Yellow-orange light bounced and throbbed through the jumble of once-forest. I remained low, but now I could hear. The 2-legged rustled. It was noisy and careless while its fire snapped. And the rabbit smell was very faint, distorted. I could see it now, this 2-legged, seated in that foolish way 2-leggeds have, crossing one foot over the other. It rustled again and held a big stick over its fire — the stick jabbed through the rabbit. The rabbit’s fur was gone from its blackened body, abandoned near the 2-legged’s thigh. My stomach twitched. My mouth filled with hunger. I took another step. The 2-legged looked up and over. He saw me, then quickly looked away. I am hunter, I am leader — you do not meet my gaze unless you want to be punished. I crouched, readied myself to spring. The 2-legged stood. I eased back. My back paws met the tangled once-forest left of the water’s anger and stopped me. I tensed. But the 2-legged lifted the big stick with its rabbit, tore a haunch with its hand. It looked directly at me again — no, I am hunter, I am leader — and threw the haunch at me. The burnt meat landed close to my feet. The 2-legged looked away and returned to its foolish, awkward sitting. It tore ragged bites from the burnt rabbit, holding the big stick between the paws of its upper limbs. My stomach demanded food. I scented the burnt rabbit, the smell of blood faint and smoky. I did not hunt the rabbit, I am not like the vultures and scavengers … but I was hungry. I nosed it, picked it up and turned away from the 2-legged. The flesh was warm. It sated. I licked my paws, swiped my whiskers and jowls to groom. For a moment, my mind tricked me. I heard my pup. I scented my mate, my others, we were sated, we curled together, our warm bodies close, to sleep through the long cold night. Except the 2-legged. Its odour was unmistakable, deer hide, rabbit, something sweetly sour I thought must be its own scent, not the ones borrowed by the other animals it ate or draped over its body. I studied the 2-legged. It had curled on its side. The fire beside it throbbed yellow and orange, throwing strange shadows where they should not be. When I looked away, my sight was poor. I would not look directly at the fire again. All was silent, save the angry water behind us. We lived. Nothing else lived. The water took everything. I dreamed of my mate, his powerful howls alerting our cousins of our hunt; the deer was warm, its blood and flesh giving us another day of life. The deer was old and slow, an easy hunt. 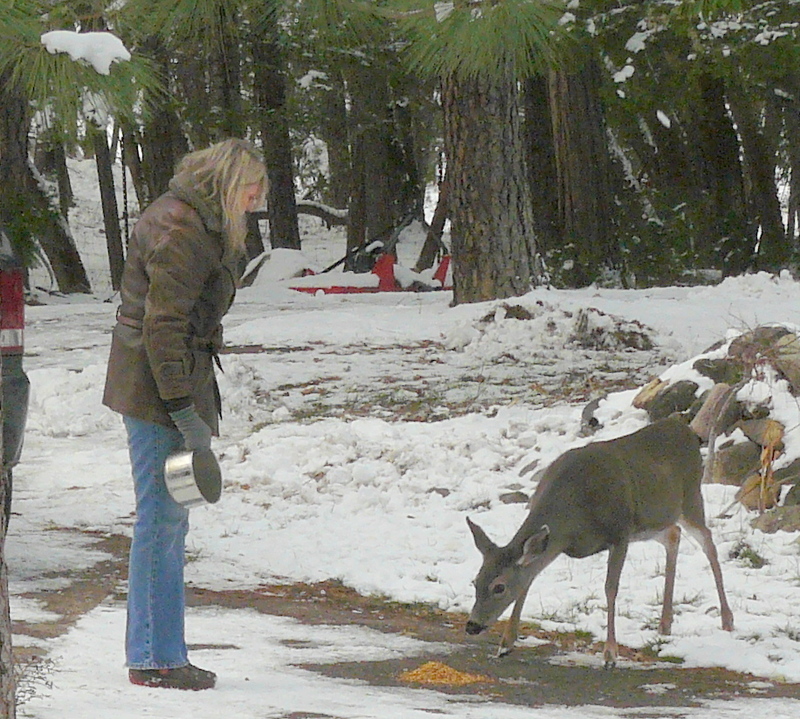 Its time had come; we knew that, understood it, this deer and our pack. I dreamed of my sisters, nipping at my pup, teasing her to chase them in mock hunts. I dreamed of my brothers, circling and securing our family. My pack. My life. The day hung low and grey. Overnight, the angry water had become a sussurrating hiss behind us. With its strange flat feet and its big stick, the 2-legged was tossing dirt and wet leaves over the ash where the fire and the rabbit had been. The old fire flared briefly. A cool damp gust caught some of the sparks and swept them high. A bird swooped near to see, then lost interest, flapped its wings to gain height. The smell in the air was smoke and faint rabbit scent. It was upturned earth and rot and rain. The 2-legged’s odour wore the smoke and long-dead deer. The 2-legged came close. It looked at me — no — I am hunter, I am leader, you do not meet my gaze. But it was stupid and foolish, this 2-legged, like a pup that had not yet learned. It neared me. I growled, prepared to attack. Surely it could see my flattened ears, my lowered shoulders? No, it was stupid. It walked passed me. I watched. The 2-legged paused and turned. It swung one of its upper limbs down low, then away, a sweeping motion. Strange language. It did not lower its ears, or roll on its belly. It made noises with its mouth. The noises were terrible, low, rumbling, but they were not threatening. I watched. It made the motion again, then turned and walked on. I sat on my haunches. I am leader, I am hunter. But this 2-legged did not understand. It had not learned from its pack. We two were the only ones I scented. We were alone. The angry water had taken the others. The 2-legged stopped, made the strange sweeping motion and noises again. I took a step in its direction. My pup cries in my mind. My mate howls. My sisters tease, my brothers scout. But around me is silence, the scents dirty and empty, the forest destroyed, the deer gone. We two are alone. The 2-legged’s head bobs up and down. I take another step. We walk on, stepping carefully over the tangled mess that was once our home, our feet slipping in mud, scratched in dying brambles, struggling in the unfamiliar path before us. 2-legged uses the big stick as if it were a third leg. It is learning. I am patient. Don’t know about you but I found that story by Wendy more than compelling. Found it hauntingly beautiful. A ancient account of the first meeting between man and wolf. Therefore, can’t close without again reproducing this short extract and images of the grey wolf posted on the 20th May Musings on love. 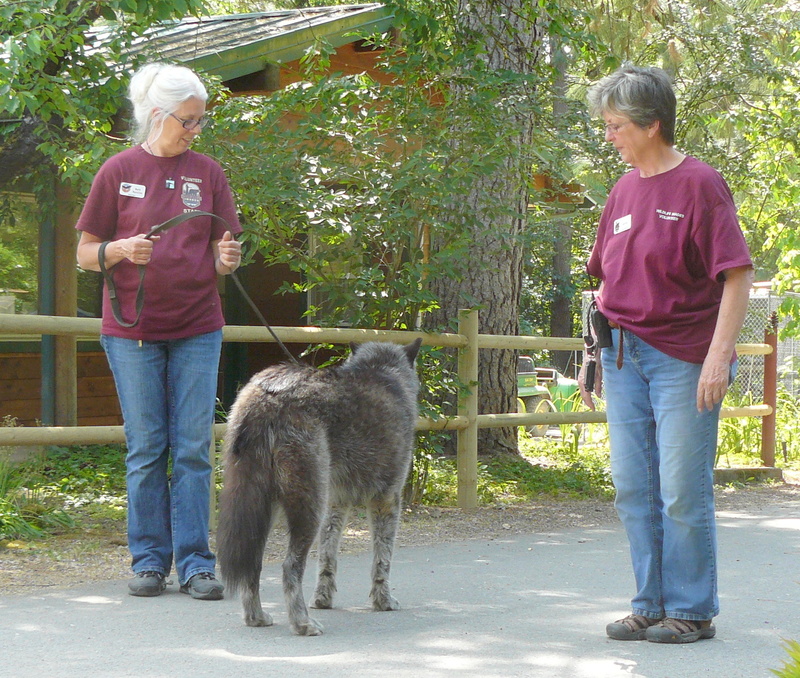 While we were looking at the animals, along the pathway came a couple of the volunteer staff walking a Grey Wolf (Canis Lupus). 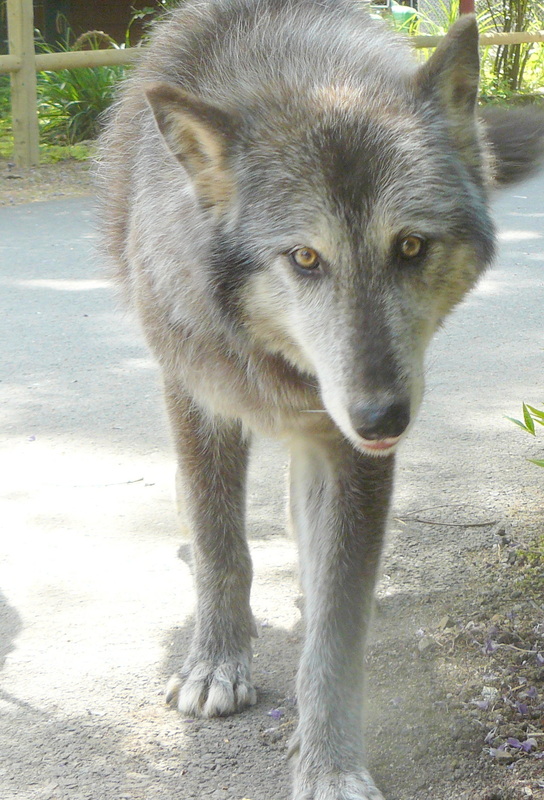 An afternoon walk for Tundra. I was utterly captivated by this beautiful animal. Her story was that she was born in captivity and owned by an individual who soon decided he didn’t want her! Not long thereafter Tundra, as she became named, was brought to the Sarvey Wildlife Center in Washington and thence to Wildlife Images when she was just 8 weeks old. Tundra turned to look at me. I stood perfectly still and quiet. Tundra seemed to want to come closer. As one would with a strange dog, I got down on my knees and turned my eyes away from Tundra’s. I sensed she was coming towards me so quickly held up my camera and took the picture below. I kept my gaze averted as I felt the warm breath of this magnificent animal inches from my face. Then the magic of love across the species! Tundra licked my face! The tears came to my eyes and were licked away. I stroked her and became lost in thought. Was this an echo of how thousands and thousands of years ago, a wolf and an early man came together out of trust and love and started the journey of the longest animal-human relationship, by far? With grateful thanks to Cynthia G. for forwarding this to me. 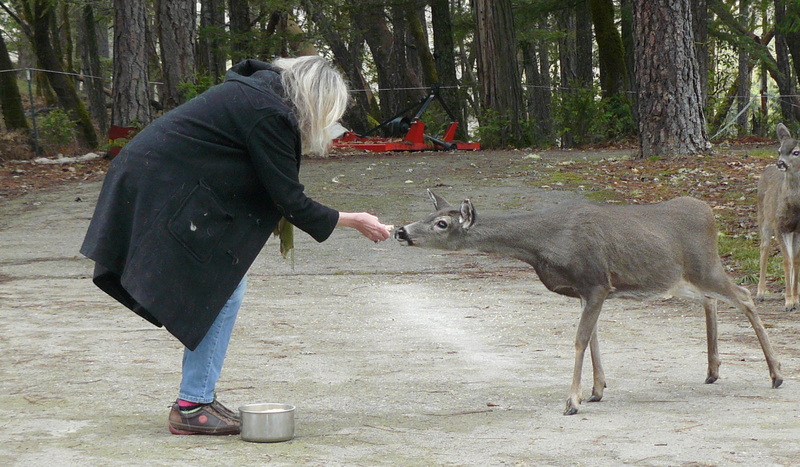 On the morning of May 18, 2011 , my wife noticed a deer in our yard that appeared to be frantically looking for something in the rocks that form a wall on our property line in Brush Prairie, WA. 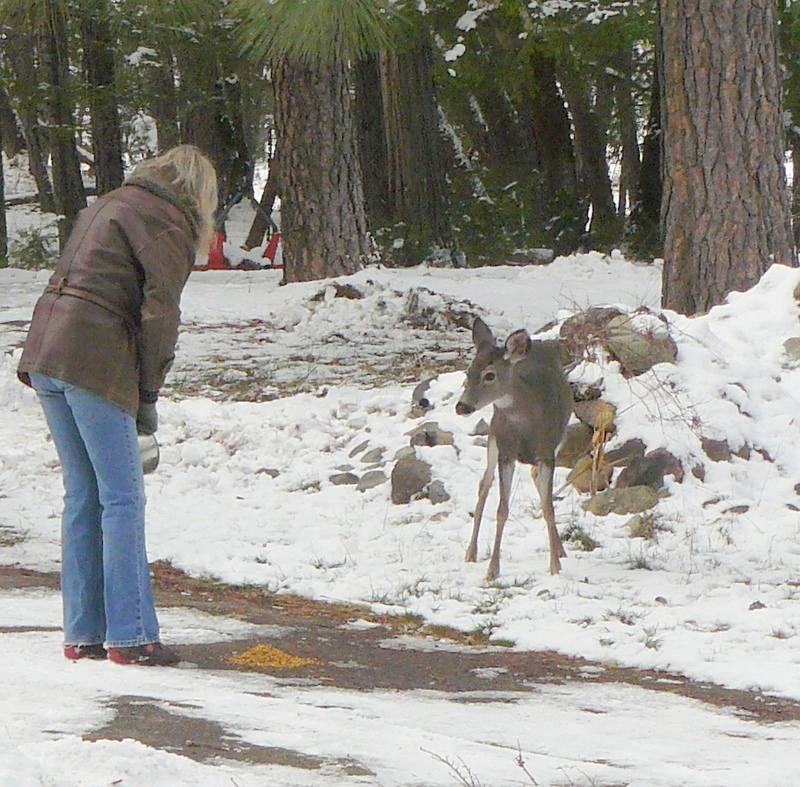 When we first went out with our neighbors, we didn’t see anything, but the deer wouldn’t leave our yard. 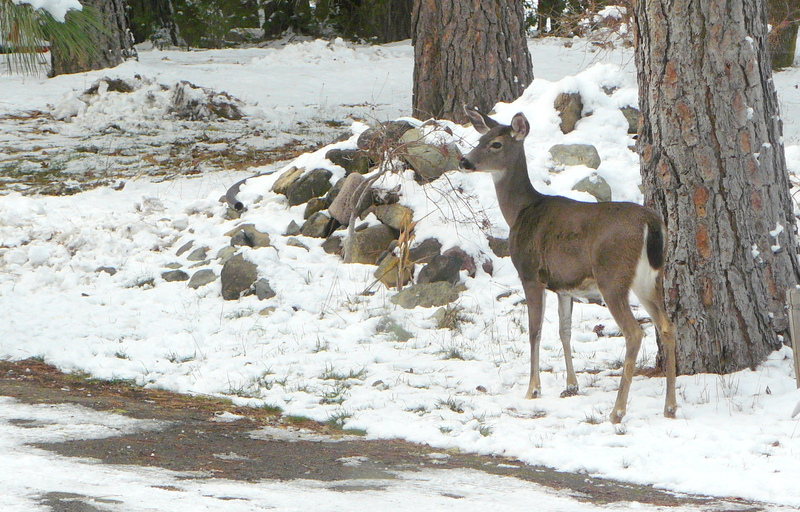 We went back to our house and watched; after a few minutes the deer came back. 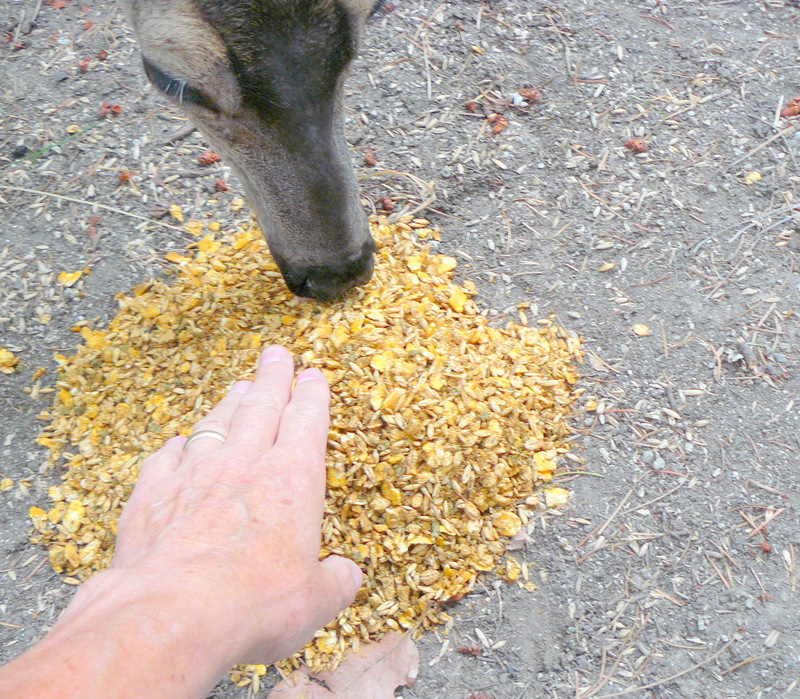 We went out to the area the deer was concentrating on and could hear a baby fawn crying in the rocks. We moved some of the rocks and smaller boulders and saw a baby fawn’s face in the rocks. He had apparently fallen in one of the gaps and was now trapped. 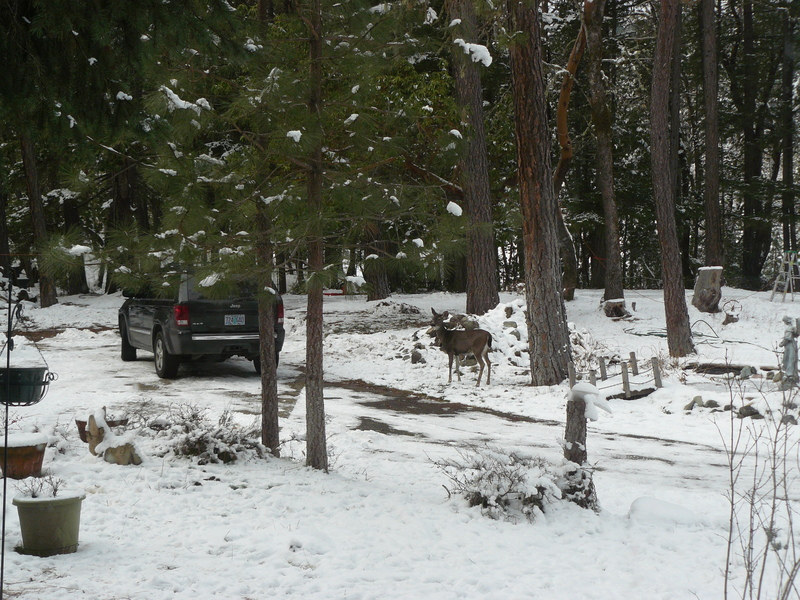 The larger boulders were too heavy to move, and we didn’t want the rocks to cave in on the baby deer. We called our Clark County Fire District 3. The B Shift team came out; they were able to move the larger rocks out of the way with the Jaws of Life enough to be able to reach in a pull the baby fawn out and reunite it with its momma. The fawn, maybe stuck in there most of the night, quickly went to nurse its momma. One of our neighbors took some video clips of the fire department’s rescue. I edited the clips into this short clip. After sharing it with some friends they thought that it was just too cute not to share with more people; my neighbor agreed to let me upload it.